We design customiezed Birth Announcement Cards. 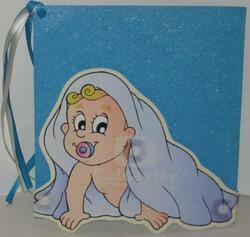 Our Birth Announcement Card are exclusive and are in vibrant colours. They are stylish and elegant. A closed position needs to be properly announced to the company. We have a branding team who would work for you to prepare appropriate announcements. Supported by highly accomplished crew of employees, we are rendering Religious announcements Printing Service. These provided services are delivered under the stern supervision of adroit personnel as per set industry principles. In addition to this, these provided services are attributed amid our client for reliability and cost effectiveness. “It’s a BOY, “It’s a GIRL – A very popular option with recent mothers. 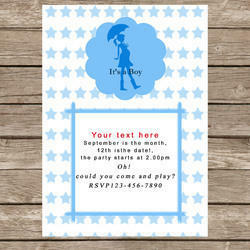 We offer Baby Announcements, Baby Shower, Children's Party Invitations, Customized Photo Cards Invitations. These creative invitation cards are uniquely designed by our designers and also available as per clients specifications. We are providing a wide quality range of religious announcement card to our different valued client. These announcement cards can be customized as per our precious customers specifications. These cards are designed and printed using high quality printing material and advance printing machines. A hand painted card to announce the birth of your child.